Celebrating Devraj and Hetal Nayak, inspiring and authentic Valentine's Day EveryDay yogis. Hetal believes the choices we make in life can greatly impact our current and future state of health. She started her yoga practice over 12 years ago after an illness made it difficult for her to walk or stand for long periods. Yoga not only helped to increase her core strength, it had a positive impact on her personality. "With this practice, your body awareness changes, as increased awareness brings mindfulness and mindfulness leads to making healthy choices in the food we eat, the TV shows you watch, the company you keep, the activities you choose to participate in and has a positive impact on your sleeping habits. In addition, yoga helps bring positive changes in the people around you. My husband, Devraj, started his yoga practice after seeing many of the benefits yoga has brought to my life. Devraj is a practicing cardiologist and has come to believe in the benefits of yoga so much, he now recommends yoga to all of his patients. We are enjoying this journey together and benefiting from lower bad cholesterol numbers, increased good cholesterol numbers, and more stamina.” This dedicated philanthropic couple is a celebration of yoga in motion. My favorite yoga posture is Ardha Chandrasana- Half Moon Pose because I love balancing postures in general. They make me feel strong, allow me to turn inward and heighten my ability to concentrate. I do yoga because it calms my mind and allows my body to express love to the world around me. Yoga has brought stillness and mindfulness to my everyday life. I appreciate the life force energy that I feel coursing through my body after every practice and the over all wellbeing that I feel through my yoga practice. One of my favorite postures is Mountain Pose because it is the pose I begin my practice with, connecting with my mind, body and a great place to set an intention. As my feet are firmly grounded into the earth, I am reminded to be present where my feet are and not think about the next step or prior step. This is a theme I try to carry off the mat, being present with every step. I initially started yoga in 2005 for exercise and movement, my practice is now a part of my self care routine. I especially enjoy practicing with a group, feeling the energy, while hearing and experiencing the power of the breath. One of the amazing gifts yoga has brought, is a consciousness of breathing, helping me in my daily life to stay present and grounded. It has also brought life long friends and a sense of community. I especially love experiencing yoga in National Parks, a soon to be 8 year veteran ranger, I have had the pleasure of practicing in historic and scenic settings across this beautiful country, a very special experience indeed. I love Wild Thing because it is such an expansive pose that stretches your body from head to toe and makes you feel as if you can literally take on the world. You can feel the shape your body makes and all the negative space around your body that you can fill with your breath! Yoga is literally my life. I do it to stay connected to the richness of the present moment, to my body and to the changes in my body and in my life. It grounds me and thrills me. I love Bound Angle/Baddha Konasana and yoga because it takes me to a great physical and mental place. My practice brings me more peace, contentment, clear perceptive, love, a cool community and arms with muscle definition. I find an enthusiastic desire to show others the path to these gifts, specially the most disenfranchised. I love this pose because you are connected to the earth and I feel grounded. The earth asks very little of us and this is a time to be still and feel the healing that occurs with that connection, drawing strength from all things that grow, by smell, touch and sensing. Practicing in nature brings me strength, knowing the trees have been through so much, yet remain strong, allowing me to find my inner strength. I started this practice 6 months ago, not very athletic and not liking sports, yet I already have experienced amazing results, physically, mentally and emotionally. I have more energy and the practice has allowed me to rewrite my story, I no longer am an aggressive defender, as was needed raising a disabled child. That chapter has passed, he is 18, I can let go and know this is the time to let it out on that still space. The practice has also helped heal a knee injury through meditation vs. medication. My mat provides that special place of respite, relief and solitude to clear the chalkboard. I look forward to practicing, centering myself with the breath and know I’m not helping anyone but myself, which has been a challenge having to do for others for so many years. It allows me to re-invent what I’m supposed to feel, learning how to live with a positive outlook, and expect the best for everyone. Compassion for others and understanding we all have challenges, is the greatest gift we can give each other. I look forward to continuing to figure out my puzzle on and off the mat. Ustrasana - Camel Pose, is one of my favorite poses because It helps lengthen the front of the legs. I do yoga because I enjoy knowing that once I am in the class room, nothing else matters. It’s a protected time to just be with myself. Yoga has brought so many beautiful souls into my life, and I am very grateful to be a part of a lovely community. I can’t say there is one asana that is my favorite, because I see the beauty in how they all thread together. I do love practicing backbends, in general, because they are exhilarating, they calm me and bring me joy. But the beauty is in the process, because every asana teaches you something, if you’re willing to listen. Yoga has been a part of my life for so long, I don’t know what life would be like without it. I was fortunate that my sister introduced yoga to me at young age and I have been practicing on and off since I was 10 years old. When I found ashtanga, I realized how valuable and powerful this incredible series was. I had been dealing with some pretty intense anxiety and coming to this practice was the only thing that could calm my mind on and off the mat. I found that the breathing I was using to carry me through my practice, created a beautiful habit without me even consciously knowing it and this breath came to me when I would start to feel anxious to calm my mind. I like tree pose because it helps you balance and because it reminds me of nature. Yoga teaches you how to be calm, and it can help with your breathing. I like yoga because it's fun when you put all sorts of postures together and get to move your body! I like this pose because it's fun to balance on my hands and it took me a long time to learn to do it, so I'm proud of myself. I like yoga because it makes my breathing better, I have better control over myself. I've been doing yoga for a long time - since I was 2 - and I've learned to really like it, even when we're doing yoga and not playing kid games with my mom. 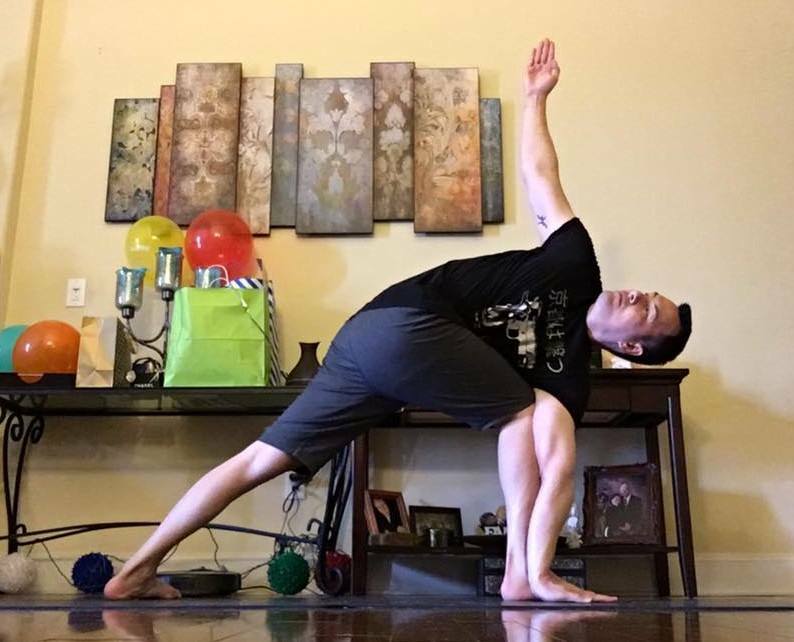 I started yoga after the birth of my first son to try to get back into shape as well as to possibly help with the symptoms of hypothyroidism. Yoga definitely helps physically, but it also helps me be a better mother, wife, and daughter. I find I have more patience. Yoga teaches me over and over again to slow down and breathe. There is no posture/asana, that I call my favorite. I do have asanas, that I focus on and Kapotasana is one of them. With the definition of focus in mind, I could say this is my favorite asana because you can learn a lot about yourself practicing it. Kapotasana is asana number seven in a sequence of eight asanas of the intermediate series of Ashtanga Yoga. Kapota means dove or pigeon. The chest comes out like a pouter pigeon. It is a challenging pose, because it is a deep back bend. The back muscles contract, the pelvic region is stretched, the chest is expanded fully and the spin bends in the lumbar area. The practitioner should also use the thoracic region to get fully into the pose. The pelvic, throat, chest and especially heart region are fully exposed and completely vulnerable. In this asana, mentally and psychologically, we show our weakness, vulnerability and this is sometimes not easy. The heart opens and in yoga philosophy the soul resides in the heart. The yoga practitioner observes what is coming up from the inside; emotions, thoughts, memories and what comes in from the outside; surroundings, people, animals, plants, objects etc... This also happens off the mat. Kapotasana is a complex asana and why I focus on it. I started Ashtanga Yoga, because I had a serious sciatic problem. I didn’t know what yoga really entailed. Over time I learned that yoga is a one package deal, physically, mentally and spiritually! The practice changed my life. I started to relax, physically and mentally and therefore can step away from all the activities around me, able to observe myself, my body, my emotions and my thoughts. Noticing patterns, helped me to change things in areas where I was not happy or lacked as a person. I learned to let go, surrender to the higher consciousness, Brahman and before I knew it, life was much easier and things worked out! This process made me a better person, like helping people, doing things for the good of everyone, and not reacting to aggression or have any expectations. I practice Ashtanga Yoga, because it is a powerful and millennia old practice, and based on the eight limbs described in the Yoga Sutras of Patanjali. The practice is a self-study (svadhyaya) of the body and mind. Through continuous practice, the practitioner will gain a deeper, clearer, subtler insight and understanding of the self, affecting all areas of life. I am now open and willing to change my specific mental, psychological set up, even things that everyone automatically learns from the day we are born; from family, society, school, culture, etc. I try my best and give Love freely! That is the best reward from my practice. My favorite posture is Salamba Sirsasana/Supported Headstand, because who doesn’t love a little extra support when the world is upside down? My practice brings balance to my mental and spiritual pH. Our bodies and brains are amazing. They come with built in coping mechanisms that we have inherited over time to protect us from danger, but the world has changed considerably. Now, we have LOTS of stimuli on a daily basis, including stress, that can subconsciously trigger your flight or fight response, even when we're not in danger. This causes the body to tense up, the heart rate to increase, blood pressure to rise, and our breath becomes faster and more shallow. When our breath becomes shallow, we simply do not get the proper supply of oxygen to our brains, which over time can lead to panic attacks, anxiety and depression. It's a gross oversimplification, but the bottom line is, your breath effects your brain pH. When your brain is more acidic, a fear like reaction is triggered causing a slew of super fun problems, enjoy yourself a “google” about the effects, it's worth it! One of the awesome benefits of aerobic work, whether with deep belly breathing, activation in a gentle flow or a strong connection to even long breaths in a vinyasa class, is that all of our metabolically active tissues, including our brain, become more efficient at consuming (aka removing) lactic acid. Hello, relief! Yoga is such a beautiful practice. Even though it can be practiced in a community setting, it is deeply personal. Over time, through practice, yoga teaches you to find yourself. To become conscious of not only your physical body, but also your emotional state. This has brought a dramatic sense of balance to my life. Not to say that things don't get crazy and I don't let little stuff get to me from time to time, but I have become SO MUCH BETTER at recognizing when I allow myself to get into negative patterns and have a much easier time getting back to my equilibrium simply by becoming aware of what that looks like, specifically for me. I practice everywhere I go and love headstand because you can take it anywhere, as I have coast to coast. Headstands are one of the ultimate poses showing the duality of the practice because you have to surrender and also be super focused. The focus and softening, while staying present in the moment is imperative or you will fall out, which I have learned first hand. Yoga is about the triumph of finding strength, flexibility and balance in the pose and most importantly, in the mind, body and soul. Finding balance while standing on your head, helps to find balance in life as well. Yoga practice brings peace! I had experimented with yoga at various times in my life, but it didn’t really ‘click’ until I was introduced to Gentle and Iyengar styles of yoga at Jane Goldstein’s Two Hearts Yoga Studio. What brought me into the studio, was a hope to increase my flexibility and control pain. In 2002, I suffered my first major bicycling accident, when an SUV turning right on red, collided with my right hip. As I began regular yoga classes at Two Hearts, slowly but surely my flexibility increased and my pain decreased. I hit a turning point following a second cycling accident in 2015. While not as serious as the earlier accident, this one left me with a brain bleed, and I was told by my doctors to do whatever I could to slow down my heart rate, as the danger that laid ahead for me over the next 24 hours was rupture of a blood vessel in my brain. So I drew on my asana and pranayama practices to progressively slow my heart rate. It was really striking to watch my heart rate go down on the monitors as I practiced savasana in my hospital bed while still in the ER waiting for a room. At home, I also learned that using my yoga practice to regulate my blood flow would control the headaches that are typical as one recovers from a traumatic brain injury. It was these experiences that got me interested in therapeutic yoga, and I decided that I wanted to become a yoga teacher in order to be able to share these transformative practices with others. I decided to begin with a 200 hour yoga teacher training program at the Esther Vexler School of Yoga at Five Points Local studio, the first non-profit teacher training program in San Antonio. I liked that it is a very comprehensive program that runs over an entire year with outstanding community support. I graduated in May of 2017, and learned so much from my mentors Stephanie Bogenschutz Carter, Emilie Rogers, and Sreedhara Akkihebbalu, as well as from a wonderful group of classmates, but I really view it as the beginning and not end of my teacher training. Currently, I teach a weekly Gentle Yoga class at the Cancer Therapy and Research Center for cancer patients, survivors, and caregivers. I also completed a 50 hour Trauma Yoga Certification with Catherine Ashton, and taught in a workshop on Yoga for Emotional Wellness at Five Points Local. Currently, I am immersing myself in therapeutic yoga, as I study with Nydia Darby at Nydia's Yoga Therapy, and I continue to be amazed by the healing power of this practice. I am also a Professor of Biochemistry & Structural Biology at the UT Health Science Center, where I run a research lab and educate medical students on Therapeutic Nutrition and hope to one day bring Yoga Lifestyle education to our medical curriculum. Dancer is a special pose and such a treat in classes. I love how it challenges my balance and reminds me of ballet class when I was a little girl. I started yoga at fifty-five because of increasing aches and pains. Especially after long car rides, movement was increasingly difficult. I’m now close to sixty and can move more comfortably, have greater flexibility and core strength. Yoga is a wonderful balance with my cycling because I am hunched over and in a repetitive foot leg motion for long distances. My practice cultivates core strength and flexibility to complement the aerobic and endurance workout with cycling. Yoga has also brought me beautiful gifts, new friends and an open heart. I love this pose because it opens my hips, I feel relaxed, balanced and stretched all at the same time. Yoga brings flexibility, with my body and mind. I’m already a happy person and my practice allows me to be even happier, more patient and forgiving. I am able to forget what is not pleasant and cope with my prayers and practice. It also provides me courage to speak my truth with non harmful communication. My goal is to practice for many years to come and share my knowledge of goodness with others. When you give, you always get back tenfold. When I first began practicing asanas I struggled so much! Learning sirsasana taught me to be patient and put in the work, day after day. For a couple years I practiced with a teacher who had us do closing in his office - which meant doing sirsasana right in front of his HUGE fish tank. I gained a lot of confidence from those days of practice and now I can pop up into sirsasana almost anywhere! I practice yoga to be a better person. Yoga has brought me balance and simplicity. I continue to learn how less is more in all aspects of life through practice. I can’t always get up into Pinchumayurasana, but once I’m up, I can stay there forever, completely comfortable, and I’m never without a book. I don’t know what I would do if I didn’t practice yoga. My life would be unbalanced, unfocused, and full of negativity. Yoga is my other half to sport. My quiet strong steady and supportive side. If I didn’t have yoga, I’m not sure where I would be. Yoga has taught me self awareness and that everyday you can get up and meet the world, even if you think you can’t. After my practice I know exactly what my limits are for the day….. and some days, because I did my practices, there are no limitations! I have four chickens Bess, Hera, Juanita, and Annabelle. They make me happy when they play chicken tag and other chickenly antics. I think that is why I like rooster pose/Kukutasana. Yoga keeps my life balanced. When I do yoga I can forget all my worries and instead focus on my practice. My day always starts with yoga, which is why I’m always happy. Life without yoga would be sad. It has given me the chance to keep improving, making steps forward everyday. Pigeon/Eka Pada Rajakapotasana is my favorite pose because of the intense stretch I feel in my hips and buttocks, along with the release in my lower back, love it so much, I could take a nap in this pose! I started practicing yoga in 2001, after my physical therapist recommended it to help with back pain due to a herniated disk. Since then, with my regular practice over 16 years, I no longer need back surgery and no more back pain, yoga is amazing! I feel that Ashtanga yoga is truly a transformational and healing practice. It is a gift you give yourself everyday. In my personal practice; Ashtanga has helped me grow stronger mentally, physically and spiritually. It has guided me to live a more mindfully balanced life and also helped me become more fearless, on and off the mat. Ashtanga yoga just really resonates with me. The mind body connection, the breath linked with movement, the grace and strength of this ancient healing practice is beyond amazing. Paschimottanasana is one of my favorite postures because it is very introspective and I always feel safe and calm. I love the quote from the Bhagavad Gita "Yoga is a Journey of the self, through the self, to the self." To me this means everyday you practice, you have a chance to learn more about yourself, heal yourself , forgive yourself and most importantly love yourself. This pose resonates within me because I have open hips, a decent squat, core strength and like that you can teach it in an accessible way to others. Making difficult postures possible to students brings me joy, watching how the full expression for each student evolves. I also love the entrance and exit for this posture in the Ashtanga method, because sometimes the entrances & exits are the most difficult, like for this posture and life. The practice has helped me transition in/out of certain challenging seasons of my life. I also do yoga because it fills the holes and gaps in my physical activity, yoga combines strength and flexibility. But first, last and most of all, it is the linking of breath and movement. I especially cherish at this point of my practice how taking in an inhalation for 15 seconds can feel amazing! Yoga has taken me places I never thought I would go. I am amazed how the practice brings people together and takes you places you never imagined. It is something you can share with others all around the world, having had the opportunity to practice on extensive travels, I always enjoy this shared kinship. It has shown me there is no room for elitism in the practice, teaching from a nonjudgmental accessible space, we are all in this together, different practices are seamless, intertwined by life. One of my favorite postures is a Shoulderstand or Sarvangasana. With time I started to like this pose more and more as I felt it is a great avenue to learn more about the magic work of my breath. Creating this particular shape with my body, along with deep breathing, feels like I am able to meet myself on a deeper level and it also makes me excited about the immense possibilities of a pranayama/breathing practice. My yoga practice is an opportunity to practice love, patience and empathy with myself and others. Especially these days when my body is still going through a healing process after a pregnancy, it is more of a intuitive and supportive practice than ever before. It also brings me joy, fills my cup and makes me a kinder and happier person than I would be without it. My all-time favorite at my home spot, practicing while the squirrels pelt pecans from above in a beautiful tree we share: it feels like comforting grace, a great place to connect with the breath, fun to teach (you can collect your thoughts while students are in it because they aren’t looking at you and super modify friendly with block/bolster/blankets), fabulous spot to OM in, gentle place to side stretch, excellent release of tension in the neck & shoulders, yummy massage for the forehead and where I close my eyes and celebrate. In the sequence I practice, it comes towards the end and I’ve just finished an inversion which most days takes a ton of energy to sustain, so the restorative nature of this pose is welcomed like a baby into a mother’s arms. It’s a time I give thanks to God for my best friend, health, family and so many blessings. I do yoga because it resonates within my soul. The practice helps me navigate my moral compass. Whenever I’m not sure about something or in rough waters, I ask above and work it out on my mat. This journey has brought many amazing gifts to my life: good health, grace, love and compassion for others. Through the years watching friends, teachers and students all diligently working with their own compasses is inspiring! Amazing feeling we are joined together by this ancient practice that has lasted over 5,000 years. It is humbling to be a part of such an auspicious group of people. I am so very grateful yoga is in my life and honored to share. Mountain Pose/Tadasana is my current favorite posture because it’s me, “JUST ME”, on the sole of my feet, strong and straight as a mountain, my eyes closed but yet looking ahead, with my hands open and facing up to gracefully receive what God and the universe send me. When life is ‘pretty’ --like the picture (the Pacific Ocean ahead, the jungle above, and the birds singing) sure it’s easy to flow; but when things get rough, I find myself going back to Mountain Pose to remind me that I am strong and everything will pass; there is always a reason why we sometimes have to fall and yet get up. Yoga nurtures my mind, my body, and my soul. I personally practice Yoga to flourish the best version of myself. Yoga is teaching me to find the balance, peace, and joy in everything I feel, see, and do. Hanumanasana (Monkey Pose) is the first advanced asana (yogic posture) my physical body effortlessly floated into. It’s an intense hip and front body stretch for me and it serves as a heartfelt reminder of the importance and spiritual significance of taking a “leap of faith”. In the ancient Indian epic poem The Ramayana, Hanuman was reminded of his infinite strength before taking his infamous leap from the Southern tip of India to Sri Lanka. He had to have faith in his abilities and this is a constant lesson for me both on and off my yoga mat. In this asana dedicated to Hanuman, I am reminded of his devotional service to Lord Rama and the dimensions of strength: physical, mental, emotional, spiritual and devotional. As a Licensed Professional Counselor (LPC) my self-care is critical to the quality of services I provide to my clients. Without a disciplined asana practice I wouldn’t be effectively able to maintain a strong mind so that others can allow me to hold a lantern of awareness on their path. The journey of a wounded healer has no end and my practice is a key variable in my self-care that keeps me focused and most importantly grateful for every experience. Aum Sri Hanumanthe Namaha! Just starting a physical yoga practice, Sam already sees the benefits with sports. He loves wrestling and the postures have allowed his hamstrings and quadriceps to react and release quicker. Sam continues to work on flexibility and feels stronger everyday. At 17 years old, it will be an amazing journey with continued practice and determination. He already has several years of meditation experience, having discovered the benefits at a very early age, an enlightened young soul. I like the balancing postures because they give me a feeling of strength. Balance is so critical to walking and walking is critical to breathing, circulation, and general health. When I can remain calm, still and hold my balance, it gives me tremendous satisfaction. I started yoga because I had a serious back injury when I was young and people told me that it would help me keep my spine supple. I found that it also helped me calm myself during stressful periods and kept my muscles in better tone. No mid-section ache at the start of softball season even at 70. It has also helped me regain lost mobility after injuries. It is a rather gentle but insistent exercise. Yoga breathing was the first thing I ever learned and it is the first thing I think of if I feel stress. Yoga helps keep my body strong and helps me feel empowered over my life. Back in 1968 when I first discovered yoga, there were no sticky mats, no trendy yoga clothes and no local teachers. Playing team sports and cheerleading had developed a strong, flexible body, so I was able to create an asana practice on my own by following written instruction and photos in a book. What began as a yoga dance soon developed into something much more. Practicing yoga allows the individual to viscerally experience cause and effect. It wasn't long before I felt the connection between asana practice and inner peace and clarity. Then I was asked to lead a two hour Hatha class at the local YMCA. That was before Power Yoga, when all movements were slow with very long holds and rests. A desire for excellence (I am a recovering perfectionist) motivated deeper study into all that the science of yoga has to offer. It was the beginning of a journey of education and self-discovery that continues to this day. I have worn many "hats" to earn a living from waiting tables and housekeeping to hospital administrator, international shipping entrepreneur and charter yacht captain. However, yoga and music are my passion. It is my great joy to have the opportunity to share and encourage in others the gifts that yoga practice will reveal in everyone: peace, clarity, focus, mindfulness, wellness, flexibility in body and mind and an open heart. Of course having a cute, cuddly canine assistant is definitely an asset. Whether I am the student or the instructor, Jack shares his sweet nature and an occasional kiss with anyone who catches his eye. His favorite poses are Downward Dog and Savasana. Together we visit and teach at hospitals, nursing homes, schools, churches, corporate retreats...... and even yoga studios! The practice of yoga gives me the awareness of unlimited possibility and the confidence that no matter how far afield I stray, I know the path to center. I started yoga in my 80’s and now enjoy greater flexibility and find it very relaxing. It strengthens my legs, allows me to open my body and stay fit. I enjoy seated twists because I’m working on getting my hips to open more and they feel good. The wonderful thing about my yoga practice is, I always have something to work on, either my mood, posture or meditation, always the student even at 92! Growing up as a gymnast, a handstand came so easily as did aerial cartwheels. However, somewhere along the way this blurred out of my life. Being the eldest in my family, meant I had to have it all together and achieve perfection. Discovering yoga in 2003, opened a door I did not know was there. Self practice promoted my physical abilities yet this pose was unachievable for me. My fear would conquer the little gymnast in me every time. Yoga taught me otherwise. It helped me uncover and discover self-humility and gratitude. I discovered I am enough and what I have is perfection with my scars and fears. After MANY years of ignoring the inversions, I achieved a headstand and then one day out on a walk said, "Don't think about it and know at least the tree is there!" And voila! It's not a full handstand but a supported one. This pose helps me remember the many ways I am supported: by those around me, nature, a higher power, and by my faith! It's ok to be supported and seek support! This is such a wonderful pose, turns things around for a new perspective and takes you out of your comfort zone! It taught me patience and to be fearless! My practice brings me joy, peace and a sense of grounding with centering and meditation. It also brings me back to myself amidst the chaos of the day-to-day routine, it provides a safe space for inner growth and stability. So many people benefit from my practice, because yoga makes me a better person. My favorite pose is Vrkasana/Tree Pose because it makes me feel light and happy. It also focuses on balance, which is a critical part in life and in everything we do. I fell in love with the practice because it is fun, natural and you can take it with you anywhere. 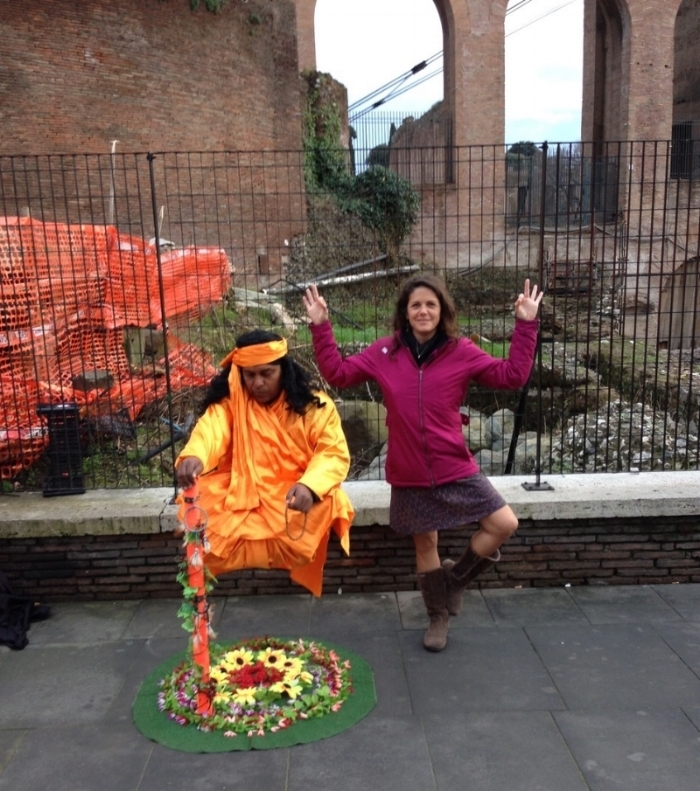 This photo was taken on vacation in Rome with a levitator, unfolding organically, which is also one of the best things about a practice, you never know where you will go. It opened a door that allowed me to fall in love with myself again. My practice blesses me with the amazing gift to accept and love myself exactly as I am. Virabhadrasana, or any standing pose for that matter, is a beautiful asana that continues to deepen the longer I practice. This pose expresses strength, openness, and even softness all in one. It is also a nice landmark asana in the ashtanga primary series. I know that when I strongly arrive here, my body is warm and ready to come down to the floor for forward bends. I practice six days a week to be the best possible version of myself. Yoga has helped me through difficult transitions in my life and has helped me overcome anxiety, low self esteem, and self doubt. I practice to be the best yoga teacher I can be. Everything I teach comes genuinely from my heart and my mat. Yoga continues to bring me strength, balance, softness, flexibility, clarity, determination, and most importantly, community. It is a deeply personal journey, but luckily we don't have to go it alone. Ann was a junior in high school when she received corrective surgery for her feet, however what occurred was the removal of several muscles which left her with life long challenges. She has also battled with Asthma her entire life. 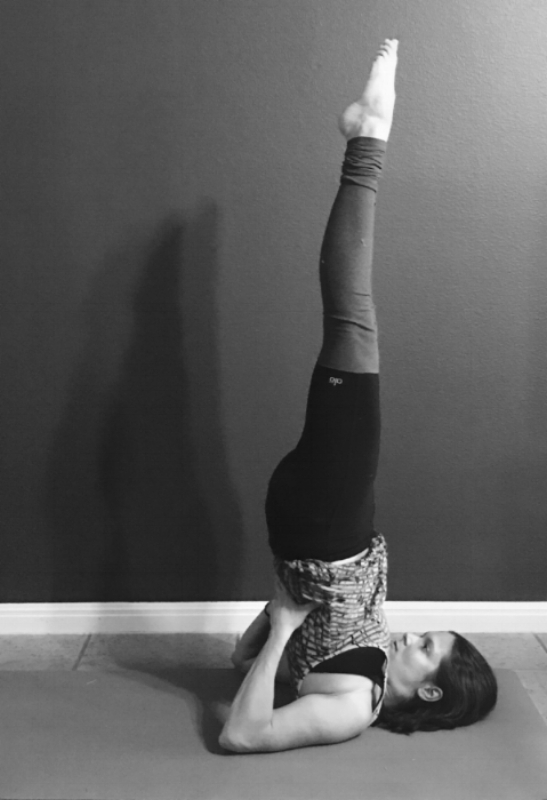 Read below on how her life has changed in the last 14 months since starting a yoga practice. Not only is she feeling phenomenally better than she has in the past 18 years, Ann also has not experienced any exercise induced asthma since starting her yoga practice and will celebrate turning 65 years young the first part of next year. I knew I needed to exercise, but never knew how intense Ashtanga really was. I have lifted weights, practiced martial arts and even walked ultra-marathons. But I have never felt such overall strength and vitality. I do not practice it, but have a medical background and have seen people who do not know how to breathe deeply to expand and strengthen their lungs who ultimately end up with pneumonia or other breathing complications. I am an orthopaedic nightmare having had shoulder injuries, surgeries to remove the muscles in my feet, torn muscles and knee injuries. With all these issues, I have very limited balance; tight and restricted upper body mobility; very tight/restricted hamstrings and hips; and breathing that is sometimes impaired by allergies and the Asthma. Yoga is not about being perfect, but about the journey getting there. I will never have a perfect practice because every day brings a new and different challenge in my life and in my practice. When I feel good about a posture, I realize a different one needs work. Yoga is letting my mind go and just relaxing. Yoga is breath to strengthen and expand my lungs. I started practicing yoga a year ago and the results have been life changing. Yoga has been a lifesaver helping relieve the pain of my arthritis. The pain in my shoulders, neck, ankles and wrists was constant, now with my yoga practice, it is manageable. I don’t hurt as much, move easier and have confidence knowing my body’s abilities. I am thrilled with how much I have accomplished in a short amount of time. I love this pose because a year ago I could not have done it with ease and it shows I am a strong individual, I feel like a warrior and can conquer anything life brings me. My favorite posture is Thread the Needle for many reasons, it feels amazing opening my shoulder, helps my back and I love the stretch with a gentle twist. I am 64 years young, brand new at the practice and already feel the benefits in my body, the pain in my back is gone and I am more flexible. I am also amazed what my feet and hands accomplish, providing me stability and balance. I look forward to cultivating a lifelong practice. I love doing yoga to feel relaxed, centered and released from my thoughts. I found yoga in my 70’s to improve my health. Since starting my practice, I have enjoyed better movement in my knees and back, which before gave me a lot of trouble. Yoga has also brought me happiness and relaxation, not only with my body also with my mind. Today I feel much better especially with my nerves, I can now calm them with the breath, practice and concentration. I am proof you can start yoga at any age and see the benefits. My favorite posture is Sirsasana as finding this posture for the first time brought tears to my eyes. It marked an incredible shift in the kind of person I used to be and the true self I was finally beginning to set free. Yoga has taught me to be one with my body, heart, and mind. In the past, I was very good at filling my thoughts with unflattering chatter. Now, my practice allows me to find stillness, in order to see myself clearly and live my truth. The gifts yoga has brought me are clarity and honesty with myself and my potential. It has unveiled an inner strength, teaching me to use my breath to calm my heart and mind during all sorts of challenges. Since incorporating yoga in my life, I now choose love and compassion for myself and others rather than judgment, continuously strengthening and nurturing myself as well as my students. I started yoga as a teenager in the 70’s, using a book, and never told anyone about it. I practiced in secret! Yoga gave me discipline, balance, and good health, but my practice never progressed beyond that original book. As yoga became more popular, I realized there was much more to learn. Finally, I joined an Ashtanga studio where the teachers gently corrected my alignment, pushed me to build strength, and encouraged me to advance my practice. Practicing with a good teacher and a supportive group opened a new world to me. Now I always have a new posture to strive for. My favorite part of yoga right now is jumping, whether trying for a handstand or just jumping through. I love that moment when the motion stops, like a ball that you throw up in the air, and it pauses before it comes down. It makes me feel like I’m 6 years old! This pose makes me happy. It's a good indicator of where my body is that day. It provides hip opening as well as heart opening, and a reaching for the stars. Opening along the whole front side of the body reminds me to open to life, to possibilities, and to be vulnerable. I started doing yoga at the recommendation of my sister to work thru a very difficult time in my life and use it as a stress relief. It has brought so much more. I discovered my soul and my passion in life. Leading me to the path of authenticity and my very own sacred satya, truth. Caprice is a yoga instructor and graphic artist who brings creativity to the mat. She found yoga to be her salvation after undergoing spinal fusion surgery. “It was very humbling to find myself in a wheelchair, unable to even tie my shoe.” Part of her rehabilitation was learning to walk again. Through this process, her yoga was a restorative comfort and helped her rebuild strength and flexibility. While practicing to heal physically, she experienced a transformative shift in her soul and began to understand that healing occurs when connecting mind and body. Believing it is never too late to begin again, she decided to become a yoga teacher, a calling deep rooted in her heart. “Going through the teacher training, stripped away my fears and falsehoods. I got down to who I really am, which was unexpected and life changing.” She now helps others discover their yoga journey. Her teaching has gone beyond the mat and on to a stand up paddleboard. “I’m a water baby, so combining my love of nature with yoga is a perfect fit.” Caprice is also passionate about animals, serving on the board of CARE, a local dog rescue organization, and going on adventures with her Rottweiler, Dascha. She is now pain free and able to live and speak her authentic truth. Yoga healed her from the inside out. She made a remarkable recovery which shows the benefit hard work and the superpowers of yoga. Once I tried this posture, I loved it. My back lengthens, hips open and I feel really relaxed as my heart melts into the ground. I love Yoga because it is good for me and helps me stay flexible, calm and peaceful. I've also seen the healing effects with students and how it transforms their lives. One of my favorites is pincha mayurasana, because it's just fun. I do yoga to keep the insanity at bay. Yoga has brought to my life balance, sweetness, great friends, a calm mind (temporarily…that’s why I need to keep doing it!) and the breathing practice (which has literally saved my life on more than one occasion). When I do yoga regularly, I’m a better, kinder, less reactive mom and partner. I remember what it’s like to feel good, and spiral upwards instead of downwards, taking better care of myself, and eating better. I practice ashtanga yoga and it took me a while to understand how to keep my body up like this. It looked opposite of the laws of nature, and it is. As I invert my body, reversing the blood flow, to put my heart on top of my head, somehow, something great happens to me (and probably to many others who practice this pose on a daily basis). I feel so peacefully balanced that a sense of timeless space appears. Practice is the key to this posture, along with patience and love. I believe it can bring the same inner connection to all of us. There is one thing that I appreciate above many good things that Yoga brought to my life, and it dwells in the feeling of connection that brings me back to myself again and again. When I do my yoga practice, I definitely face a lot of negative thinking, but the practice helps me see it more clearly, it makes me more objective and less critical with whatever is happening in my life or has already happened. Overall, this connection has had a huge impact in the way I respond to the world. Yoga is for sure a healing process, for the practitioner and maybe one day for the entire world. I love anything that opens and creates space, cultivating inquiry and opening, especially Mermaid pose, because it invites such presence yet liberation. I do yoga to return home to my creativity, courage and compassion. To return home to myself. Yoga has brought much sweetness to my life. It has taught me the power of perspective, the capacity of worthiness, the magic in maintenance, where to discover grace, how to refine clarity and most importantly a vehicle to sustainable peace. Full lotus is a deceptively simple pose that is my favorite (of the moment) because it's the pose my body type is built for. In a world where so much isn't designed to fit my frame, a full lotus feels made just for me! Anyone who knows me knows that yoga is a huge part of my life. I've been practicing almost daily now for over a year, and it has done incredible things for me. I've gotten much more flexible, lost 40 pounds, and I'm in the best shape of my life - this also includes the strength of my mind, spirit, and heart. It has taught me how to be patient with myself. Early in my journey I injured my knee all because I was impatient and pushed my body beyond its current limit. That's when I knew I had to take a step back and fully come to the understanding that my practice was not a competition with anyone, not even myself. It is not about how quickly I can "nail a pose" or when I would be able to enter into full lotus position (I still can't but I'm steadily working towards it every day). My very first lesson I needed to learn was to drop my ego and realize that the practicing of yoga is not simply about the end result; it is about the journey to that result. There is no rush, your mat holds no judgment of what you can or cannot do that day... being patient and good to myself is now way more important than "nailing" any pose. This pose has been part of my life since I was a 14 year old boy in the late 60's. I had not heard of 'yoga' then, but found I could balance like that. It was 40 years later, in my 1st year of yoga, that my vinyasa teacher taught a pose she called Mayrasana. She had no expectations that any of us could do it. I did it, which shocked her and me I had not done that shape in 50 years! I am a double cancer survivor; kidney cancer (1997) & prostate cancer (2002 & 2005). In 2005, my prostate cancer metastasized into my entire skeleton. I started hormone therapy to control the cancer. My oncologist told me that once in the bones, there is no getting rid of the cancer. Two years later, the side effects of the hormone therapy were getting to me, primarily weight gain (30 pounds) and depression. That’s when my oncologist in Philadelphia recommended the MBSR program. The MBSR program is an 8-week program pioneered by Jon Kabat-Zinn at the University of Massachusetts Medical Center. The program teaches mindfulness meditation & very gentle yoga. On day one, we were taught the body-scan meditation. The next day, I practiced it upon arriving at work (in the parking lot). On the walk into work, I noticed that the pain in my legs and pelvis, pain that I had for the last 18 months, was gone. I also realized that I was smiling. My depression was gone! I was also suffering from osteoporosis of the lumbar spine. I received treatment for this starting in the late 90’s. Once I finished the MBSR program, I found a yoga studio and started practicing yoga 3 days per week (Vinyasa, Hatha, & Yin). I also continued my daily meditation practice. After 18 months or so, I started practicing yoga daily, with the intent of taking teacher training (Vinyasa Yoga). Yoga really agreed with me! A year after I started practicing yoga, my lumbar-spine density increased 4.2%. My endocrinologist could not explain this gain. The protocol that he had me on could only slow down the loss of bone density, or at best, stop the loss. I credited the turnaround to meditation and yoga. In the second year after I started practicing yoga, I had another 4.2% increase in lumbar-spine bone density. In November of 2009, I started practicing Ashtanga. Later the next year, I had a 13.9% increase in bone density. In the fourth year, another 9.9% increase. A few more annual scans showing increases of 4,2% per year followed. I no longer have osteoporosis! My endocrinologist was blown away by these results. I smiled at him and told him that it was due to the yoga! In the Fall of 2010, my nuclear bone scan showed that most of the bone mets from the prostate cancer had disappeared – only two spots remained! My oncologist could not explain this. I told him it was the meditation and yoga. By 2012, I was practicing Ashtanga Yoga 6 days a week. I’m healthier, stronger, & more balanced than I have ever been. I’m a strong believer in the power of yoga and meditation to improve quality of life for cancer patients/survivors. My January 2017 Nuclear Bone Scan showed NO evidence of the last two spots of metastasis! My doctors are amazed at my recovery.